At the very end of the season finale of Supergirl that aired this past Monday, we were treated to one cryptic flashback, to say the least. As it turns out, another rocket left Krypton upon its destruction around the same time Kara’s did. The major difference, however, is that some bizarre cult presided over the figure contained within, seemingly baptizing it with blood. To be quite honest, the first villain triggered in my mind was that of Doomsday, as this situation draws somewhat of a parallel to Smallville’s interpretation of the brute. Aside from him, I considered H’El, but both are associated with the titular heroine’s cousin, Superman, and, lest we forget, this is supposed to be Kara Zor-El’s story. 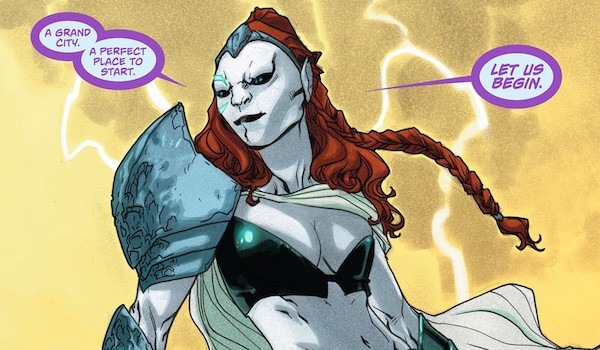 And as much and I’d like to see Doomsday before this series wraps, it’s for the better that the Maiden of Might get as many villains exclusive to her as possible. Since this is an antagonist unfamiliar to mainstream audiences at large, we’ll offer a bit of background by saying that Reign found herself experimented on by Kryptonian scientists as a youth in an attempt to make her and a handful of others like the Worldkillers of old before causing all sorts of trouble for Kara on Earth as an adult. As of now, it remains unclear if Reign will be acting alone in season 3 or will have some help in tow, but we’re excited to see where this goes regardless.